The cream should be used once or twice a month. It can be dabbed on and dragged around the metal with a paper towel; OR you may use a retired, soft bristle toothbrush, dampened with the brightener, and simply brush the cream ALL over your jewelry. Brush the cream around your jewelry three or four times. Brushing the cream is the easiest way to clean earrings, chains, necklaces, bracelets, even metal watchbands (DO NOT SUBMERGE WATCHES). The cream turns into a biodegradable foam when brushing. The ingredients still work in the foam to remove tarnish and oxidation for seven to eight minutes. 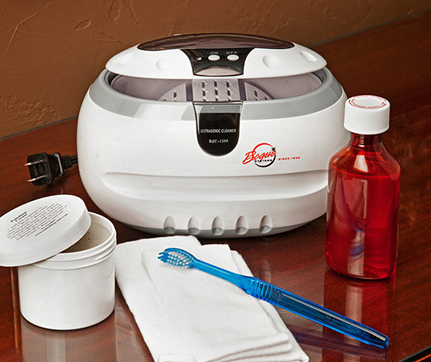 For the ultimate cleaning: use our ULTRAWAVE sonic machine! Using our brightener, in just three minutes your rings, earrings, chains, necklaces, glasses, bracelets and waterproof watches will look as good as, or better than brand new. This is the preferred cleaning method and eliminates the need to soak overnight. Follow the instructions included with the machine. Or, manually weekly touch up your jewelry with the toothbrush and brightener to keep it film free. Diamonds, sapphires, and rubies can be soaked manually overnight in our brightener every week or two. Most soft stones are glued in place; it is NOT recommended to soak any stone that might be glued. Posts on soft stones are usually a backup. DO NOT soak any soft stones, since soaking more than three to five minutes in anything liquid, that can soften the glue. Use the brightener on your bathroom mirror, glasses, car windows, computer monitor, and TV screen to retard fogging and collecting dust. Concentrate: For soaking jewelry, use contents and mix with half gallon distilled water. Do not use an old milk carton or tap and well water. For Ultrasounds mix contents with 1 gallon distilled water and use for cleaner for machine. Our brightener/cleaner really works well for removing dirt and film. REMEMBER Our cream makes the metal look bright and new by removing tarnish and oxidation. Our brightener/cleaner removes dirt and film from your stones and designs.